Steve Martinez was arrested and charged with his 9th DWI at last nights checkpoint. 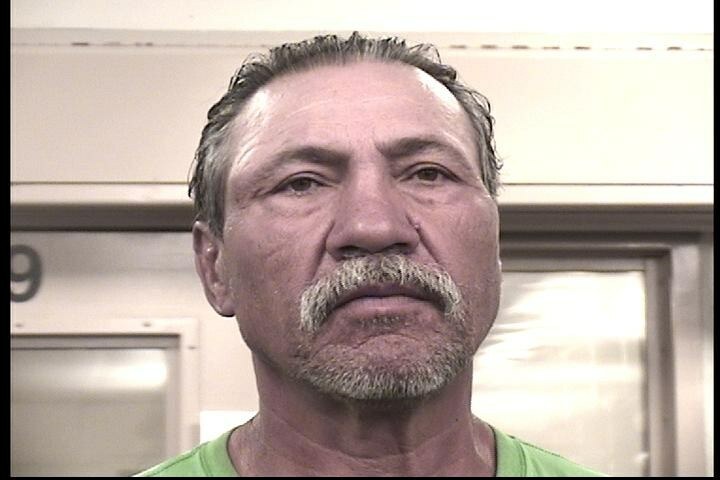 Steve Martinez, 61, was arrested and charged with his 9th DWI last night after nearly striking several officers working a DWI checkpoint in the Valley Area Command. The Albuquerque Police Department was working a DWI checkpoint in the area of Lomas Blvd and Broadway Blvd in an attempt to remove intoxicated drivers from Albuquerque roadways. Several DWI officers were standing in the roadway speaking to drivers when a white GMC pickup entered the checkpoint. The pickup slowed down then quickly accelerated through the checkpoint nearly striking several officers as it exited the checkpoint. Safety plans in place for these types of situations were executed and two of the vehicles tires were deflated by using spike strips. The GMC was quickly located on the I-40 on-ramp near University Blvd with the driver attempting to get onto the freeway with two flat tires. The driver later identified as Steve Martinez was observed in the drivers seat as officers arrived. Officers then observed Martinez get out of the drivers seat and start walking up the on-ramp towards the freeway. Martinez was given several commands to get back into his vehicle to which he ignored. Martinez was then told to stop walking and he ignored these commands also. Once other officers arrived Martinez stopped and was taken into custody. Officers located several open containers inside Martinez's vehicle. They also discovered the GMC was registered to Martinez and that he did not possess a valid drivers license but had an issued identification card on a revoked status. Martinez was less than thrilled that officers were able to catch up with him. At one point he was kicking a police vehicle and continued to act disruptive while he was in police custody. According to MVD records this arrest was Martinez's 9th DWI arrest. Martinez was charged with the felony charges of Aggravated DWI and Aggravated Eluding along with other misdemeanor charges. He was also on probation for disorderly conduct which he violated by obtaining these charges. The Albuquerque Police Department DWI Unit did an outstanding job making the streets safer for the community last night. The checkpoint had 611 vehicles enter the checkpoint and resulted in 10 arrests. Officers also had 41 vehicles identified as a Uber, Lyft or a taxi service taking patrons home. We want to remind the community to think ahead and make arrangements if you plan on drinking. DWI is a preventable crime and can stopped but police can not do this alone.